Curious Gulf Coast: Why Doesn't Florida Have A Plastic Bag Ban? No plastics bags to be seen on Fort Myers Beach. The costal community would like to ensure it stays that way with a plastic bag ban. But a Florida statute prempts them from doing so. Bill Veach chairs the Marine Resource Task Force of Fort Myers Beach. And just this year, the town council came to the task force to look for a ban on plastic straws. "We recommended that they restrict plastic straws from the beach. The type that were not biodegradable," said Veach. "The town council debated it went through a series of hearings and elected to restrict all plastic straws from being sold on the beach." The Lani Kai Island Resort on Fort Myers Beach just got biodegradable straws last year, but the straws aren't made of paper. Melissa Schneider, with the hotel, shows off a small cache of bright green plant-based straws that will soon have to be replaced. 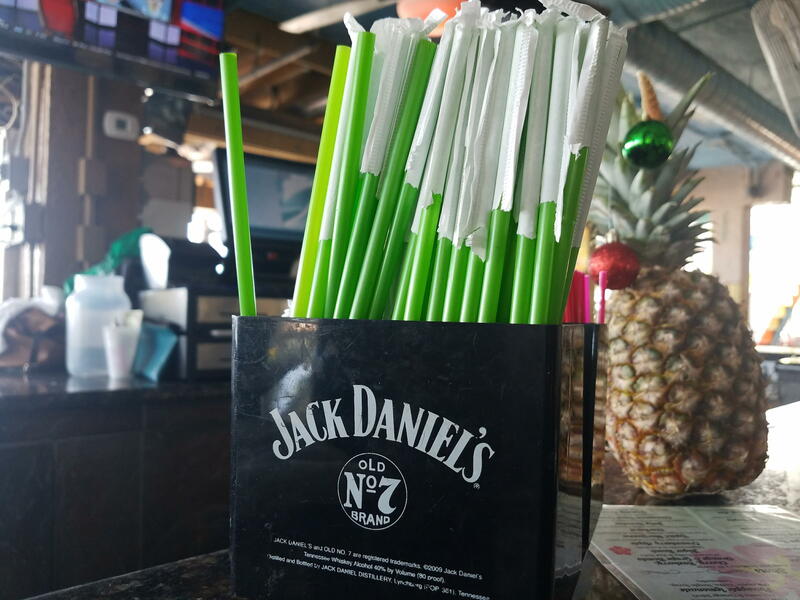 The Lani Kai's bar is stocked with bright green florescent plant-based biodegradable straws. However, they'll soon have to be replaced with paper ones. Schneider said the resort is happy to make the environment cleaner. 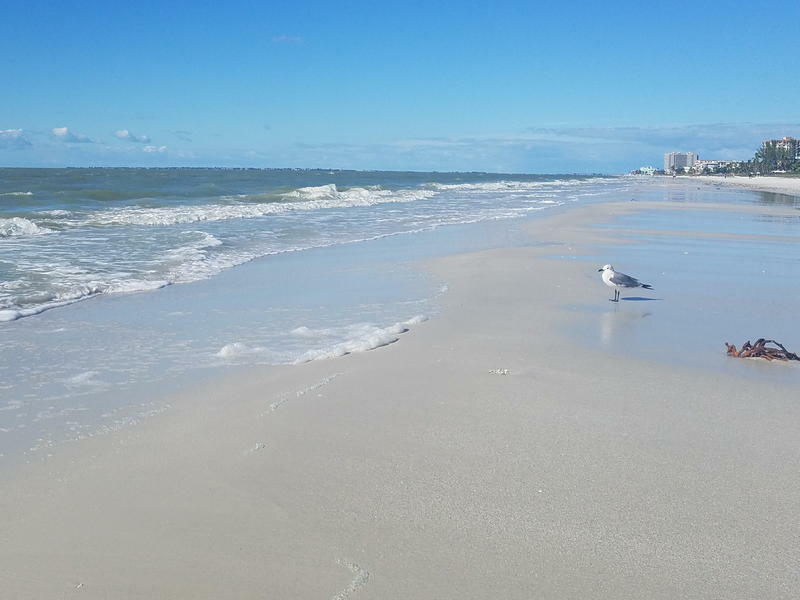 Back in November, after coming to an agreement on banning plastic straws, Fort Myers Beach wanted to tackle plastic bags next. But Veach from the Marine Resource Task Force said they put the brakes on that idea. Coral Gables, a seaside community near just south of Miami, tried to ban plastic bags and is now in a legal skirmish. “They were sued by the state and by the retail association," Veach said. "They went to court and recently. They won the case, saying that the state legislature has not done what they were supposed to do which was make take actions based on this department of environmental protection report. It is now in the state is appealing it." He said they’re now waiting on that ruling to see how Fort Myers Beach should proceed. Miriam Ramos is the attorney for Coral Cables. She said the city is being sued because there are a couple of Florida statutes that preempt municipalities from banning items like plastic bags. However, after that ruling, the state of Florida appealed. And was joined by the Florida Retail Federation. Samantha Padgett is a lawyer with the federation. She said the group’s mission is to stand up for retailers who serve their customers—providing plastic bags is part of that service for some. "The statute clearly states that there is not to be any local regulation of plastic bags whether it's a ban a tax a limitation you know it just physically regulates it. That is not supposed to take place at the local level. So overall that's our end,” she said. So, Veach, with the Marine Resource Task Force for Fort Myers Beach, said he’s waiting on a ruling regarding Coral Gables plastic bag ban to determine how they should proceed. Ramos, the attorney for Coral Gables, said the ruling could take anywhere from a week to several months. She said other cities around Florida have contacted her to say that they’re keeping an eye on the litigation, hoping to implement bans of their own.